NOW A MAJOR MOTION PICTURE Robyn Davidson's opens the memoir of her perilous journey across 1,700 miles of hostile Australian desert to the sea with only four camels and a dog for company with the following words: "I experienced that sinking feeling you get when you know you have conned yourself into doing something difficult and there's no going back." 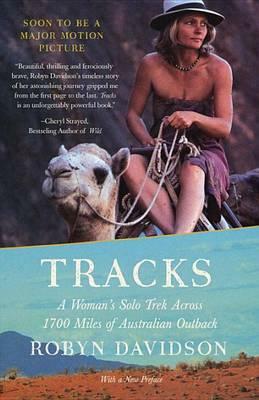 Enduring sweltering heat, fending off poisonous snakes and lecherous men, chasing her camels when they get skittish and nursing them when they are injured, Davidson emerges as an extraordinarily courageous heroine driven by a love of Australia's landscape, an empathy for its indigenous people, and a willingness to cast away the trappings of her former identity. Tracks is the compelling, candid story of her odyssey of discovery and transformation. "An unforgettably powerful book." --Cheryl Strayed, author of Wild Now with a new postscript by Robyn Davidson. "Beautiful, thrilling and ferociously brave, Robyn Davidson's timeless story of her astonishing journey gripped me from the first page to the last. Tracks is an unforgettably powerful book." --Cheryl Strayed, bestselling author of Wild "Vivid and vivacious. . . . Davidson is as natural a writer as she is an adventurer." --The New Yorker "Engrossing. . . . Lyrical and salty. . . . Candid. . . . Best in her accounts of her days alone in the desert and what they did to and for her. . . . Her states of mind . . . veer between feelings of being at one with the cosmos and feelings of being utterly crazy." --The New York Times Book Review "Saucy and unsparing. . . . A strong book, the kind that clings to your back after you've read it." "Every bit as witty as her camels--and a first-rate writer besides." --Newsweek "What continues to resonate with readers isRobyn Davidson's honest introspection throughout the journey. It prompts the reader to ask herself, 'Would I do this?' and 'Could I do this?'" --A Traveler's Library "The integrity of this articulate and impassioned account is evident in the fact that Robyn Davidson does not find glib solutions to inner or outer conflicts. Like her camel companions, she seems temperamental, insatiable, and slightly crazy, but also determined, direct, vulnerable, and splendid." Robyn Davidson was born in Queensland, Australia, and is the author of Tracks, the extraordinary account of her 1,700-mile journey across Australia with four camels, which won the 1980 Thomas Cook Travel Book Award and became a film in 2013. She has written extensively for National Geographic and other magazines, and is also the author of Desert Places, the novel Ancestors, and the essay collection Travelling Light. Ms. Davidson lives in London, India, and Australia.